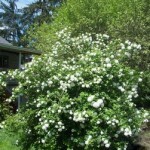 A large shrub with white, rounded clusters of flowers that cover the plant in the spring. It does not set fruit. The deep green foliage turns bright red in the fall. 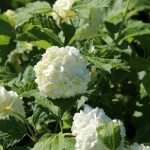 This old-fashion shrub is widely adaptable and will thrive with little care. It prefers a site in full sun to part shade, in an average, medium moisture, well-drained soil. Prune as needed after flowering.